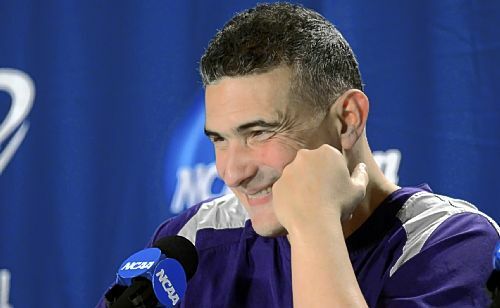 As a Kansas State student and as a reporter, I saw Frank Martin coach the Wildcats in three seasons. My freshman year, he took the team to the Elite Eight. My sophomore year, he guided it to a Valentine’s Day victory over No. 1 Kansas on Big Monday in Bramlage Coliseum. My junior year – this year – he took a group some had pegged for the NIT and racked up yet another 20+ win season, allowing the Wildcats to advance to the third round of the NCAA tournament and nearly knock off 1-seed Syracuse. While those big accomplishments were awesome to cover, the details are what I will remember about Martin. When I first heard rumors of Martin going to South Carolina, I hoped they were not true. These are some of the reasons why I am sad to see him go. We’ve all seen the coach’s famous tirades on the sideline. Those are notorious. What we don’t usually see is what happened with just a few games left in the season. It may be a regular occurrence; this was just the first time I noticed. I glanced over at the Kansas State bench a few minutes before the game, and Martin had taken a seat and drawn his two young kids onto his lap for a hug before ushering them back to sit with their mom, Anya. The profane, smoke-out-of-the-ears Martin is the version that ESPN cameras find so compelling, but the focus on family is something people don’t see most of the time, and that is what makes Martin endearing. One tirade in particular I do remember. I had scurried to the interview room in the Sprint Center after Kansas State’s loss to UNLV – the same loss before which the Wildcats had announced the suspensions of Jacob Pullen and Curtis Kelly. Apparently Kansas State’s locker room was on the other side of the wall of that interview room. All I remember is, “21 f—— turnovers. 21 F—— TURNOVERS!” The screaming continued even into the press conference of the winning coach … none other than former K-Stater Lon Kruger. I had the privilege of interviewing Martin one-on-one this year. I asked him at the beginning of the season if I might be able to talk to him in Spanish sometime. I minor in Spanish, and I had heard him do interviews in the language before, so I thought it would be a great experience and unique opportunity. He agreed, and so I arrived at his office, and we talked for 30 to 40 minutes. He was open, encouraging and thoughtful in his answers to the questions I had written out beforehand so I would not get nervous and stumble over the words. When I got through all my inquiries, he gave me what I consider a great compliment: “You’ve got that language handled.” We continued to chat in English after I had gotten through my basketball questions, and he asked about my classes and career plans, which made an impression on me, because as a head coach of a D-I basketball team, you know time is a precious commodity. I followed up our interview with a thank-you note, and he made sure to thank me for the thank-you note a week or two later. You do not have to cover Martin very long to realize that he cares about the overall future of his players as well as their progress in the game of basketball. Go to three or four press conferences of his, and it is more than likely that you will hear him begin an answer with, “In life …” Martin may appear to be the behavioral opposite of football coach Bill Snyder, but when it comes to preparing players for the time they will spend away from the playing surface, he and the 72-year hold similar values. He often spoke about the importance of not coddling kids because when you do, you make them unprepared for what they will encounter in the real world. He was hard on his players, but he also stood by them and inspired their loyalty. As a journalist, it is painful to see Martin leave. Who could possibly be as interesting? Who would be as forthright – either answering questions in detail or simply stating that he would not answer a particular question? Who could be as charismatic? Who could be as approachable and endearing off the court despite such an intimidating on-court demeanor? Those characteristics are unique to Martin, from what I have seen, and Kansas State will miss him. South Carolina got a good guy.